“Feedback …… is the rocket fuel that propels the acquisition of knowledge and without it no amount of practice will get you there”. One of the most interesting books I have read on high performance is Matthew Syed’s Bounce. Syed was England’s Table Tennis Champion for many years and competed at the Barcelona and Sydney Olympics. He now works as a prominent sports journalist in the UK. Bounce explores what really lies behind world-beating achievement in sport and other walks of life. In doing so, Syed explores the success of a wide range of high achievers including Mozart, Roger Federer, Picasso and David Beckham. The general view that we have of high achievers is that they are blessed with extraordinary natural ability. However Syed’s central thesis is that natural ability has very little to do with high achievement and more to do with implementing the right conditions for performance. One of these conditions is purposeful practice and meaningful feedback. In exploring his own development as a table tennis champion, Syed points out how he was instructed by his coach to change his highly variable forehand stroke. Sometimes his forehand was played with a high arc, sometimes with a bit of sidespin. Syed reasoned that the variation in his forehand made him an inventive player. However Syed’s coach insisted that the forehand should be identical every time it is played. For two months, Syed’s was instructed to repeat an identical forehand in training so that it is “played with a long sweeping arc, starting from my (Syed’s) right ear and finishing a few inches above my ankle and taken at precisely the same height of the net with exactly with 80 degrees of knee bend” (p. 94). This was practised until it was encoded into Syed’s DNA. Syed questioned the value of spending so many gruelling hours practising the same stroke without any variations. But with the wisdom of hindsight, he realised his coach was creating the conditions for purposeful practice and meaningful feedback. With a variable forehand it is difficult to identify what was wrong when Syed made an error was made. However by reproducing an identical stroke, it is far easier to identify technical errors so that corrective refinement and readjustment could be made. In other words, Syed was empowered with a tool for automatic feedback and a powerful mechanism for learning. In his own words, “feedback …… is the rocket fuel that propels the acquisition of knowledge and without it no amount of practice will get you there”. When implementing meaningful assessment for our students we also strive to provide the right conditions for purposeful practice and meaningful feedback. If we can provide the right conditions, our students will have tools to identify their strengths and weaknesses and to make refinements. More importantly, purposeful practice and meaningful feedback will help build the capabilities of our students to make effective decisions about their learning. Jacaranda is committed to providing the right conditions for learning. 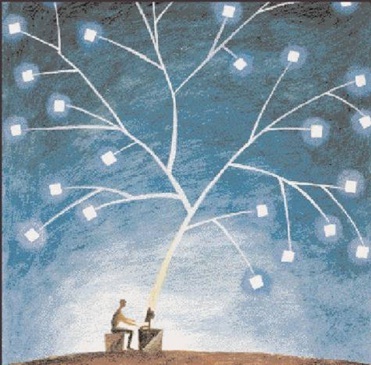 Purposeful practice and meaningful feedback is deliberately built into all of Jacaranda’s digital-first products including assessON, Knowledge Quest, myWorld Atlas, myWorld History Atlas and studyON. Assessment of learning (to compare what has been learned to what has been taught). Assessment for learning (to check what is known and what needs to be known to complete a learning task). Assessment as learning (enabling students to self-assess and find out more about themselves as learners). Whether your students are striving to hit the perfect forehand or solve a difficult equation, purposeful practice and meaningful feedback is vital in all learning contexts. Like Syed’s coach, teachers need to create the right conditions for this to occur. Your students will thank you for implementing and optimising the right conditions for their learning. 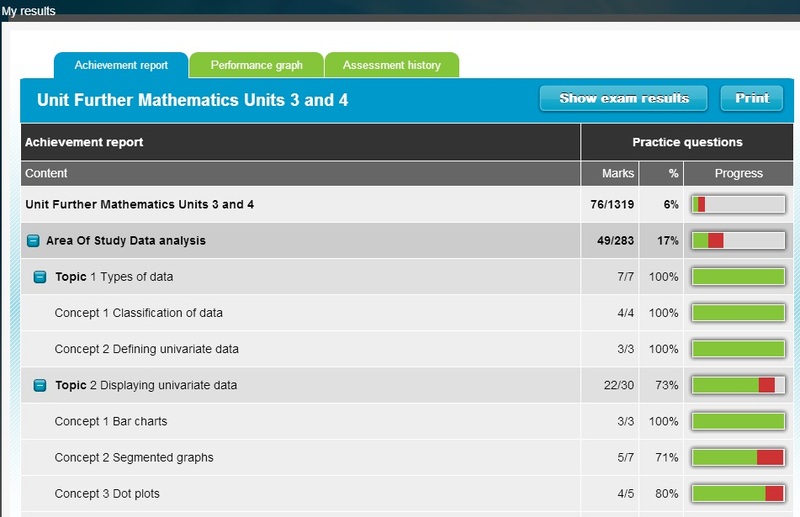 In the past week various teachers have contacted me with questions about Jacaranda’s myWorld Atlas app. Viewing this on an iPad? View tutorial for iPad (without narration) below. More information & tutorials can also be accessed from Jacaranda’s Customer Support Centre. On my holidays I went to……..
An old favourite for some teachers is to start the year by asking their students about their holidays. Students would then sit down and write a few paragraphs on their holiday highlights. Why not ask your students to add their holiday highlights in myWorld Atlas. Where did they go? What did they do? They can easily add a pin to their globe to show the location of their holiday. Then they can create a multimedia display of the features of their holiday. Add notes, images, videos and weblinks. A case study will then be added to the pin. 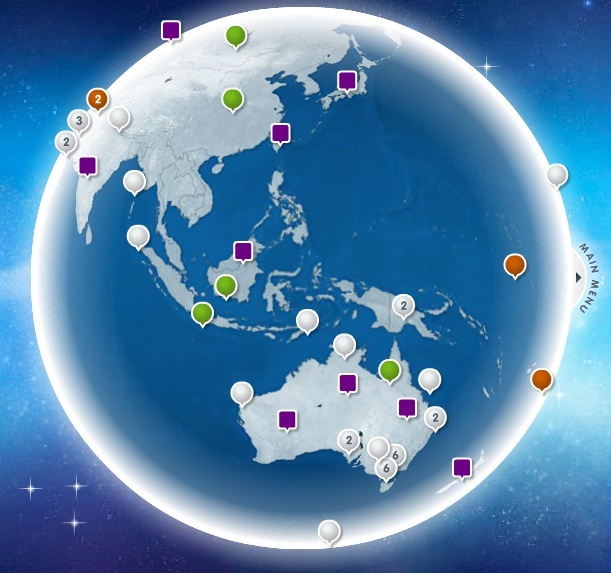 If your students are connected to you in myWorld Atlas Teacher Edition, you will see all of the pins and case studies on your globe. You can take this a step further by showing all of these pins on a data projector. Students can then select their pin and speak briefly to the class about their holiday. Students can even go as far as sharing the news of their holiday online with classmates and friends. 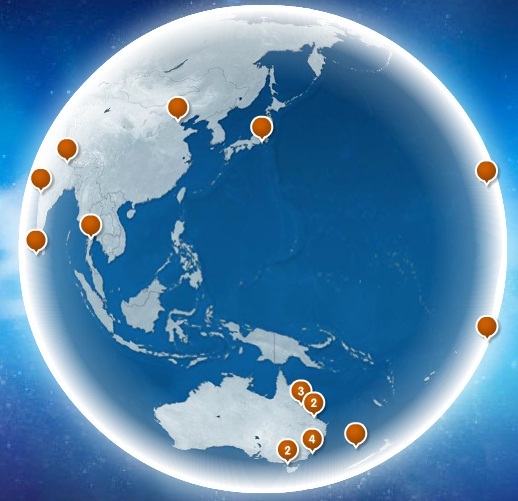 Go to www.myworldatlas.com.au and click on the orange pins to see examples of case studies that were created by students in 2011. 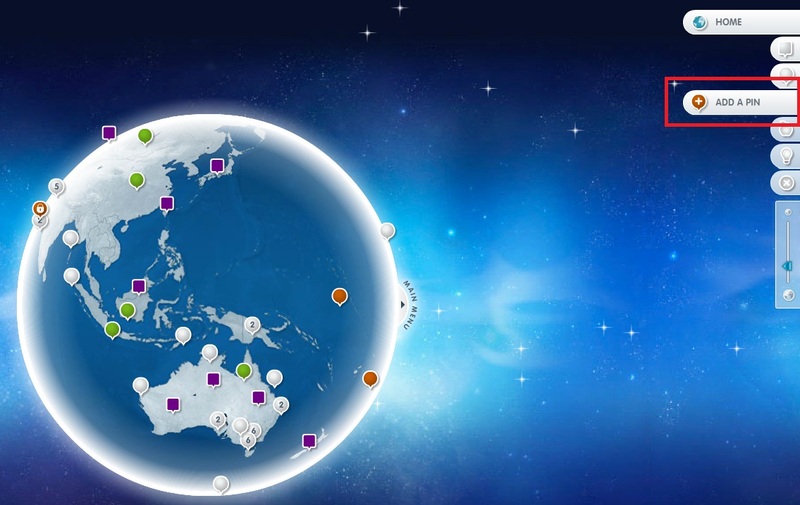 Creating a holiday case study is a good way to introduce myWorld atlas to your students. It will also help you to learn a little bit more about your students at the start of the year. myWorld Atlas nominated as finalist at AIMIA Awards! This truly reflects myWorld Atlas as a ground-breaking digital learning resource and a leader in educational publishing. Congratulations to all the Jacaranda folk who have been involved in producing this amazing interactive learning resource! Getting your priorities right with myWorld Atlas! Teachers truly deserve their holidays! I remember that wonderful feeling when I walked out of the school gates on the last day of the year. An enormous weight was lifted off my shoulders. No need to think urgently about what I will cover in my next classes or stressing about getting those assignments marked before tomorrow morning. On the last day of school, the only thing that really matters to you is the next 5 or so weeks. Time to go on holidays for well deserved R & R at the beach after another gruelling year. Time to catch up with dear friends who you only see at Christmas because you are so busy throughout the year. Time to adopt a refreshing new view of the world. If you are travelling during these holidays, why not use Jacaranda’s myWorld Atlas to plan and record your time away. You can use the ‘add a pin’ tool to track the places you visit on the myWorld Atlas globe. Create a case study for each pin by adding your own notes and photos of your travels. Then select the ‘share’ feature so that your friends can view your holidays in Facebook. No need for your friends to have or even know about myWorld Atlas. Your adventures can be viewed directly from their news feed in Facebook. In the new year I will post some tips on how you can use myWorld atlas in your classes. More about that later – the only thing that really matters now is getting your priorities straight!